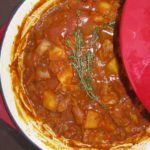 Slow Cooker Beef & Sweet Potato Tagine – a delicious, hearty stew with Moroccan spices, perfect for a cozy meal on a cool day, plus your house will smell of the amazing warm scents of cinnamon and cumin as it simmers away in your slow cooker. A tagine is a Moroccan dish slow-cooked with meat, fruit and vegetables and is named after the type of clay pot in which it is traditionally cooked. 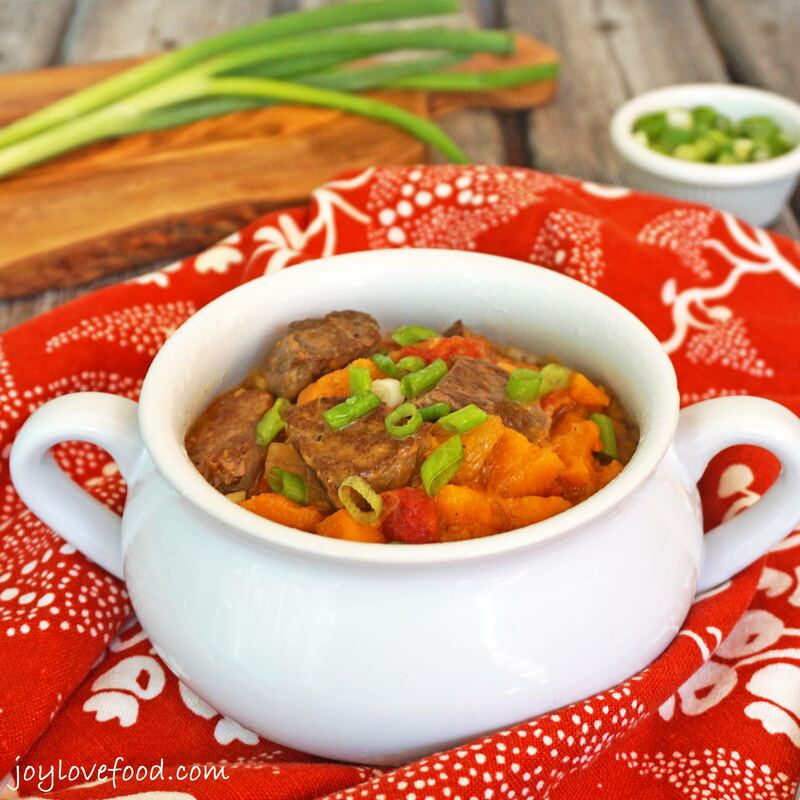 Today, I’m sharing one of my favorite versions which combines cubes of beef, sweet potatoes and dried apricots and is made in the slow cooker. During my 20s, before I had kids, I did a lot of travelling, both for work and for fun. I’ve been all over the world, but one place I haven’t been is Morocco. Luckily for me, there used to be this amazing Moroccan restaurant, called Chez Es Saada, in New York City, which is where I lived for most of my 20s. My husband and I went there often. Eating at Chez Es Saada was an experience, it was subterranean, colorfully decorated and they even had belly dancers, and definitely made me feel like I could be in Morocco. I had the most wonderful tagine there and this Slow Cooker Beef & Sweet Potato Tagine captures the flavors that I remember. Chez Es Saada also had this wonderful cocktail made with blood orange juice. We loved it so much that my husband recreated it for us at home, this is his recipe for Blood Orange Juice Cocktails, they are a wonderful accompaniment to this Slow Cooker Beef & Sweet Potato Tagine. 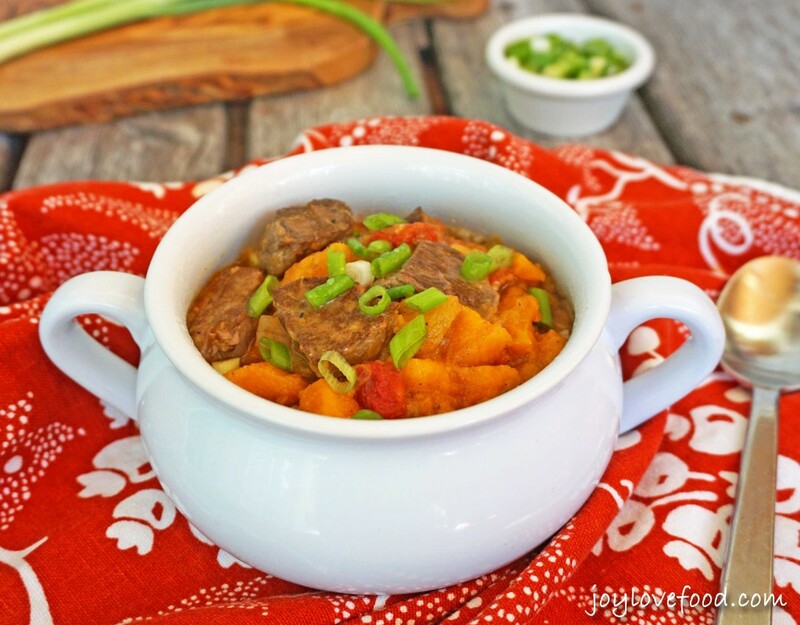 This Slow Cooker Beef & Sweet Potato Tagine is a hit with all three of my kids. My son loves the way it smells. When he comes home from school, and this is simmering away in the slow cooker, he always exclaims how wonderful the house smells. I’m always happy when he says something smells good, because I’ve learned that when my kids like the way something smells, they are much more willing to eat it, and that certainly holds true with this tagine, my son is always thrilled to have it for dinner. Do you have a favorite Moroccan dish? Please let me know in the comments below! 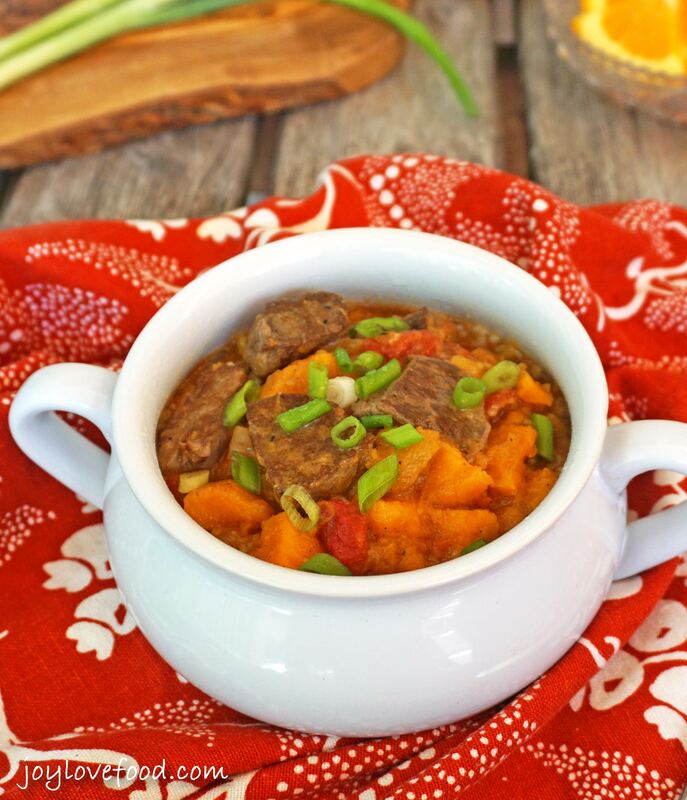 Slow Cooker Beef & Sweet Potato Tagine - a delicious, hearty stew with Moroccan spices, perfect for a cozy meal on a cool day, plus your house will smell of the amazing warm scents of cinnamon and cumin as it simmers away in your slow cooker. Pat beef cubes dry with a paper towel, to remove any excess moisture. Heat oil in a large skillet over medium-high heat. Cook beef, stirring often for 3-5 minutes or until browned. Remove beef from skillet and place in 6-quart slow cooker. Add in sweet potatoes, dried apricots, onion, garlic, salt, cumin, cinnamon and diced tomatoes. Pour beef broth over mixture in slow cooker. Cover and cook on HIGH heat for 3 ½ - 4 hours or on LOW heat for 7-8 hours or until meat and potatoes are tender. Serve over top couscous and sprinkle with green onions if desired. If short on time, you can skip browning the meat in step 2, simply place meat directly in the slow cooker, it will still be delicious. 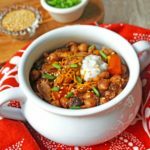 This entry was posted in Crock Pot / Slow Cooker, Main Dishes, Soups, Stews & Chilies and tagged apricots, beef, comfort food, crock pot, fall, gluten free, main dish, Moroccan, party, slow cooker, stew, sweet potatoes, tagine. Just tried this amazing recipe. We both loved it. I was worried about the cumin and cinnamon mix but since we love both spices I gave it a shot. So glad I did. 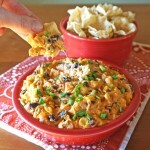 Hi Bonnie, I’m so glad to hear that you enjoyed the recipe, it is one of my family’s favorites! How pretty does this dish look? 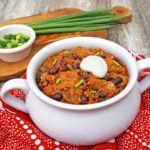 Wow, great photos, delicious slow cooker meal – what a winner! 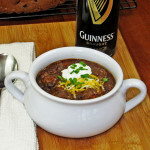 We love slow cooked meals and this looks hearty and flavorful! Can’t wait to put this one on the menu! What a beautiful fall meal! I adore sweet potatoes! Your stew looks so bright and delicious. I would never have thought about adding apricots ..sounds interesting. I love using the slow cooker! It’s one of my favorite kitchen tools! It just makes everything so tender! one of my husbands and my first dates was to a great morrocan place in Minneapolis – complete with cushions on the floor and belly dancers – SO fun. I cannot wait to try and recreate the flavors at home – hopefully my kids are feeling adventurous!! I would love to go to Morocco! If for no other reason to over indulge in the delicious food! Yum! This sounds awesome. Love the flavors in here. Printing this to try someday soon! I do love tagine and this looks very colorful. We are big in to sweet potatoes at the moment as well so ticking all the boxes! Thank you Caroline! I’m with you, I just love sweet potatoes! This looks so perfect! I wish I could take a bite right now! Pinned and tweeted. Thank you for being a part of our party. I hope to see you on tonight at 7 pm. It wouldn’t be a party without you! This recipe looks delicious! Thanks for linking up at the Home Matters Linky! I’m with your son on this…I’m sure it smells wonderful with cinnamon and cumin. I like exposing my son to foods from around the world. He thinks it’s fun too. Thanks for sharing with See Ya in the Gumbo this week! Pingback: The Lady Prefers 2 Save | Welcome to the Merry Monday Link Party #29! What a great tip! Hello, my name is Misty, from The LadyPrefers2Save at http://theladypreferstosave.com, and I’m one of the new co-hosts for the Merry Monday Linky Party! I wanted to write and let you know that your project will be featured as one of my featured projects this week on the Merry Monday Party, on my blog, as well as will be linked to the Merry Monday Pinterest board, as well. Thanks for linking up at the Merry Monday’s Linky Party this week. Have an awesome week! Misty Nicole Overstreet-Roberts (The Lady Prefers To Save) recently posted…Dollar General: Last Day of Harvest Seasonal Items & Pre-Black Friday Toy Savings! Hi, thanks so much! I’m thrilled to be featured at Merry Mondays on your wonderful website!! I just wanted to personally invite your to week #9 of #PureBlogLove Link Party, for Recipes and DIY crafts! I absolutely love your blog, I can’t wait to see what you will share with us! Starts tonight (Thursday-Sunday) ! Thanks so much Heidy! I will definitely be over at #PureBlogLove! Thanks Nicole! I will definitely be back at #PureBlogLove! Love all the freshness of this dish. Thanks for sharing at Foodie Fridays. Hope to see you again this week. Thanks Shari, I will definitely be back at Foodie Fridays! My husband would love this! Can I use chicken or pork? I don’t eat beef. Maybe he won’t mind eating the whole thing himself with the beef!! AnnMarie recently posted…Tips on Starting Your Christmas Cookies Now! Looks delicious! I don’t think I have ever had Moroccan food, but I love trying foods from other cultures. I have a feeling I would like it! Thanks so much for linking up with us at Foodie Fridays!